We are now living in an era where social networking websites, such as Facebook, Plurk and Twitter, play a vital role in spreading your thoughts and your websites. Not only that you will be able to acquire referrals through the use of these social networking websites, you can also gain avid readers, excellent comments and more online friends. Among the social networking sites, most web specialists prefer Twitter as the best vehicle to propagate attention-worthy stuffs. In the real world, the word of mouth is possibly the best form of advertising, likewise over the internet, Twitter is the closest thing you can refer to as ‘word of mouth’. 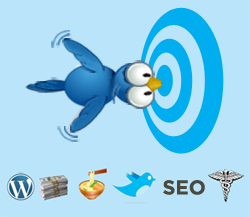 This only means that you need to get your target audience to tweet about your website. Here are some things you can do to do just that. 1) Learn to express your website concept 140 characters or even less. Make sure you allot space for the URL so be brief with your website concept, possibly, 100 characters. The next thing you should focus your attention to are the things that happened after the launch – who is tweeting and how they are tweeting. Make sure that your message gets through to your readers. To give you an idea on which sections of your website are most useful, it is essential to get feedbacks from your readers and act on matters you need to improve if they view your website different from what you want. 2) Sketch an image that describes your website the best. Your primary goal is to give twitterers a reason to click on your link and find more interest about it. 3) Even if your target viewers are not on Twitter, their most favorite bloggers are. More than just referral links, Twitter credits its users a great deal directing huge amounts of traffics to websites. Since people are tweeting about a certain entry in your website, you can establish traffic without much effort in advertising. Bear in mind that the ones you need to reach are the most internet-savvy people which can be found mostly in Twitter. 4) Make sure that your Twitter ID can be recalled from the name of your website. This will help you establish a brand on the online world. This strengthens your web presence and gives you some authority upon responding to certain user issues. 5) Place a Follow Me on Twitter Badge on your website directing to your Twitter page. Since you are trying to get more people to come more often to your website, you can gain loyalty through Twitter. Putting a badge or a follow me link at a prominent place at your website will be an easier way for your visitors to track on the recent posts in your blog when you tweet them and eventually go check it if your tweet has caught their attention. It is better than RSS for the simple fact that it is a lot more personal – that is also why you should try to convert your RSS Feed followers to Twitter followers as well. 6) Make sure that your Twitter homepage resembles the design of your website. It would be great if your readers recall your website when they see your Twitter page. Using the same color scheme as well as background makes your followers feel fluid while viewing your accounts and matching them with your website. Try adding extra details on your websites when designing the background image to offer the readers more of your insights. 7) Be Responsive – Turn your “Show me all @ Replies” mode on. The primary reason for this is for the Twitter followers to be able to contact you – whether it is for praise or for clarifications and questions. Also, try sorting your personal Twitter account with the one you are using for your website. Twitter has always been a great help in addressing user concerns fast. 8) Establish your Brand. Try using Custom Alias feature in TinyURL. This is very helpful in lengthy Twitter messages as sometimes it could limit you in including your entire URL on your tweet. That is why it is important for your to try this cool TinyURL feature for you to be able to shorten your link and be able to spread it along with a brief and concise message about your website using Twitter. Try searching your website name just to see how many people are tweeting your website and using URL shortening applications. If you are not getting the results you wanted, try to append the filter:link to your search. Mainly, the reason for this is to see who’s connecting to you and as well as to search for new clients and attend to other people’s concerns. Now the next thing for you to do is to subscribe these in your RSS readers. This is a great way for you to be able to address issues concerning the readers at the moment. It is also somehow flattering to be able to find people who are actually discussing about your website. 10) Keep your Twitter account personable and avoid spam. A lot of followers unfollow Twitter accounts for this specific reason. No one wants to follow someone who is just busy promoting himself or his creations 24/7. The fact that they are following you means they are interested and are already a part of your users, hence they do not need to be pimped at. One of the wonders of Twitter is that it enables people to somehow get an overview of other people’s lives especially those who are not close to them. To nurture your followers, tell your users about the relevant changes and recent updates to your website. Let them join your celebration if you win an award for blogging or if you get featured at a high-traffic, and popular website. However, do not focus your tweeting to just that. The key to getting more followers is to capture their interest – interest that serves their concerns.